The family EREBIDAE has split up the family NOCTUIDAE and LYMANTRIIDAE has now been placed as a sub family LYMANTRIINAE of EREBIDAE. (EREBIDAE now also includes the old family Arctiidae as a subfamily ie. 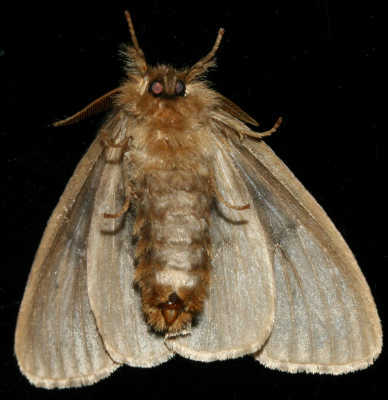 EREBIDAE ARCTIINAE.) (Watch those word endings). 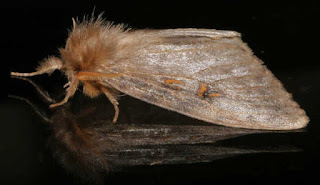 There are going to be many such changes as moths are re-identified. In the interests of people like me with older books and using sites that, although extremely helpful, are still using the old divisions I will try to put both the old and new names in each post. The changes have been around a while now so perhaps it is time for me to start catching up. Previously named Leptocneria reducta LYMANTRIIDAE. 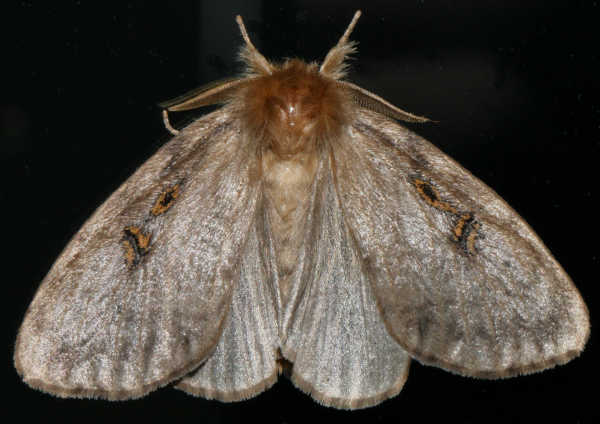 Common name, White Cedar Moth, and the caterpillars are sometimes called "itchy grubs" because of the irritating scales that can cause severe itching. Larval food plant is Melia azedarach ( Meliaceae), common name white cedar (and 10 other common names), named for the appearance of the timber. The White Cedar tree fruit and leaves are toxic to livestock , dogs and humans and the caterpillars do not seem to be generally eaten by birds. Some animals and birds are not affected. The entry for the week Nov 10 2015 has been updated. Digama marmoreal is now Sommeria marmoreal, this also brings up the family Aganaidae which is now a subfamily of the newly formed (about 2012) family Erebidae. The family Erebidae has split up the family Noctuidae and includes the old family Arctiidae as a subfamily Erebidae Arctiinae. The second entry for last week (May 17 2017) has been updated. I have added the correct identification.